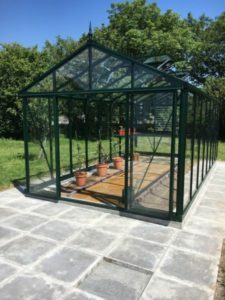 This lovely Master Victorian Greenhouse has just been constructed by us in Cong, County Mayo and our customer is delighted with it and has kindly sent in this photograph. The Master Victorian Greenhouse from Janssens is available in four sizes, the one pictured is the largest of these at 3.1m wide and 6.06m long. With a generous height at the sides of 2m, lots of ventilation and with a very strong ‘box section’ aluminium frame it is no surprise that this is a very popular model.